Home / Marketing & Merchandising / How to Create Affiliate Ads? How to Create Affiliate Ads? Affiliates features allow you to promote your online store by allowing other website owners or bloggers to sign up to be your Affiliate Partner and sell your products for a commission. Please follow the step by step instructions. 1. From your webShaper control panel, click Marketing > Affiliates, and click Step 1: Configure Affiliate Settings. i. Number of days for affiliate cookie: Sets how long to track cookie on visitor’s computer. ii. Currency for Affiliate payout: Currency to pay your Affiliates Partner, eg: MYR (Malaysian Ringgit). 3. Don’t forget to click Save. Affiliate plan enables different affiliates to be given different incentive for sale. 1. From your webShaper control panel, click Marketing > Affiliates, and click Step 2: Create Affiliate Plans. 2. On Manage Affiliate Plans section, click Create. i. Plan Name: Your plan/package name. ii. Commission: How much percent your Affiliates Partner gets when someone click on your banner/ads. Once you have completed Step 1 until Step 3, you are ready to accept Affiliate Registration on your online store. This step teach you to create and track affiliate advertisements. 1. 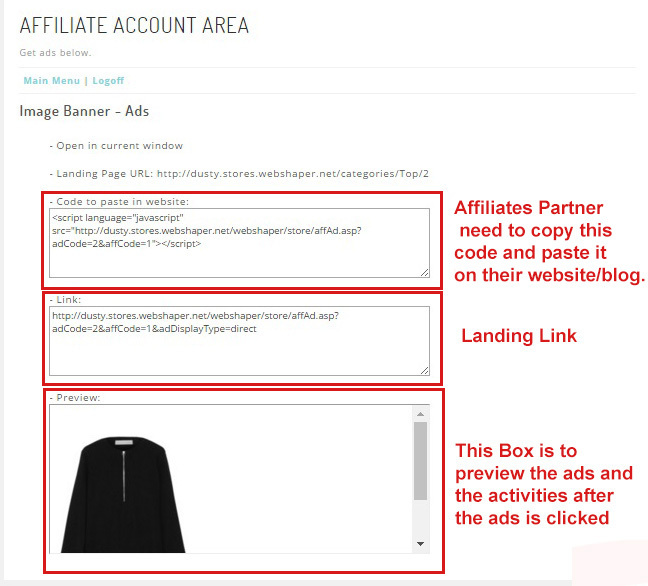 From your webShaper control panel, click Marketing > Affiliates, and click the Step 3: Create Affiliate Ads. i. Name: Name of your ad. ii. Type: Your ad whether it is text/image/code. iii. Active: To activate your ad and appear it in your webStore front-end. iv. Open in new window: When someone clicked on your ad, then they will directly go to the link of the banner in a new window. v. Land Page (URL): Destination of URL when someone clicked the link. vi. Affiliate Plan: Choose the plan that you already created from Step 2. 5. Now you have complete insert the affiliate ads on your Webstore. On the front-end’s footer, search for affiliates and click it. You can register as a Affiliates Partner to see how it’s gonna look. So let’s proceed to Step 4. This part where you can approve or reject affiliates registration and manage affiliate partner details. 1. From your webShaper control panel, click Marketing > Affiliates, and click the Step 4: Manage Affiliate Partners. 3. On Edit Affiliate Partner section, scroll down and look for Status. 4. Click the drop down list beside it. Choose for Approved. Once you approve their registration, your affiliate partner will be able to login to the affiliate page and get to the affiliate ads html code to put on their website. 1. Now your account is activated. Go to [(Your Domain)/webshaper/store/AffLogin.asp] and login to your created Affiliates Partner account. Note: To register your affiliate, go to [(Your Domain)/webshaper/store/AffRegister.asp]. 2. This is the main Affiliates Page, click Get Affiliates Ads. i. Get Affiliate Ads: Page where Affiliates Partner gets the code to be pasted in their website/blog. ii. Track Banner Impression & Clicks: This page will track how many visitor that click the ads from Affiliates Partner website. iii. Track Affiliate Sales: This page will track how many sales made after visitors click the ads and visit your page. 3. So this is where Affiliates Partner will copy the code from and get a preview of the ads. To view and approve sales from affiliate partners. 1. From your webShaper control panel, click Marketing > Affiliates, and click the Manage Affiliate Sales. 2. On Manage Affiliate Sales section, click Edit. 3. You can view affiliate sales Approved status here. To view a snapshot of how well your affiliate program is going. 1. From your webShaper control panel, click Marketing > Affiliates, and click the Track Affiliate Performance. 2. In here, webShaper display the chart of how well your affiliate program is going based on total impression/clicks you get. You can filter by affiliate and also print the chart for your reference.